~GREEN BAY – Of all the goals Beniquez Brown has for his fledgling NFL career, making sure his mother is taken care of is the biggest. “Everything I have done, I have completely done for him,” Brown’s mother said of her only child. “I tell people all the time that I don’t even think people know my name. It’s like Beniquez’s mom. Brown will be playing with a chip on his shoulder. Watch out for him to become the Ladarius Gunter of this camp as an undrafted player who shows he should have been an early pick. Sam Shields is the most famous of McCarthy’s reign. ~Last year, during the 2015 NFL Draft, most Packer Draftnick’s wanted general manager Ted Thompson to use his first round pick on one of the handful of starting-caliber inside linebackers. 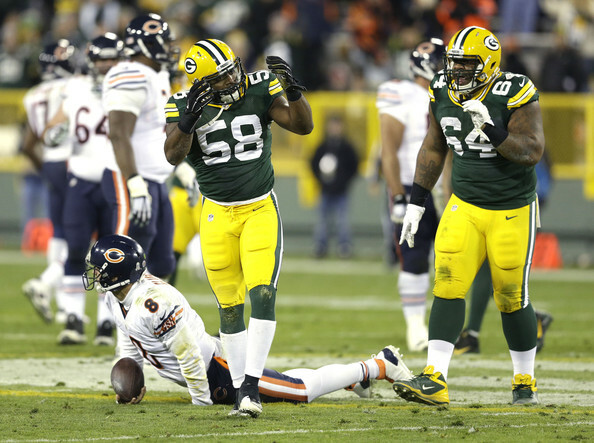 At the time, Sam Barrington was the only somewhat-proven inside linebacker on the roster, aside from Clay Matthews. Everyone should have known by then that Clay was a natural outside linebacker, who thrived best there, and who enjoyed being there. The Packers defense was making strides with Sam Barrington in the middle, similar to the 2010 defense with Bishop in the middle. When the Packers were on the clock, at pick 30, they had their choice of any inside linebacker in the class. There had been rumors of the Packers being in love with Clemson’s Stephone Anthony, who possessed the speed and height to run with fast tight ends. Others had speculated that the Packers would jump for UCLA’s Eric Kendricks, who had great instincts and coverage abilities. Still others preferred Denzel Perriman from the U. That’s Miami, Florida. Of course, as we all know by now, Thompson surprised everyone and grabbed a safety who he thought could convert to cornerback. That, of course, was Damarious Randall from Arizona State. Randall has looked very good and the pick looks like a winner. He might have some Pro Bowls in him, so Thompson deserves credit for that pick. Ironically, the next pick, number 31, was Anthony to the Saints, and a few selections later the Vikings grabbed Kendricks. Both guys are established already as their men in the middle. San Diego took Perriman in the second round. Thompson did select an inside linebacker at the end of round four, with Jake Ryan as the 129th pick. Ryan (6-2, 240) struggled as a rookie, especially in coverage where he was embarrassed at times by backs running routes. Dec 27, 2015, Glendale, AZ; Rookie linebacker Jake Ryan of the Packers tries to tackle Arizona rookie running back David Johnson. He did, however, improve as the season went on, and he looks like a guy who can help stop the run. That’s Barrington’s forte also. Neither, however, appears natural as a cover guy, and can be exposed in the passing game by teams with good tight ends and receiving backs. Week one will bring Julius Thomas from Jacksonville. This year, Thompson again bypassed inside linebacker in both free agency and the early rounds of the draft. Like Ryan last year in the end of round four, Thompson used a late pick in round four (131th overall) on an inside linebacker, Blake Martinez from Stanford (6-2, 237). Ironically, both guys were rated 5.3 by the NFL.com scouting service, as you can see clicking the links on the two players above. Blake Martinez has a chance to earn the starting spot as a rookie. But a lot can happen in the next six weeks before Jacksonville on 9/11. Martinez, however, appears to be much better in coverage. He seems like he could be a guy who can become a fixture in there, with the versatility to stay on the field all three downs. Again, they’ve barely practiced yet in pads, much less play preseason games or regular season games. So there’s a long way to go to know exactly what the Packers have there. Third year backer Carl Bradford remains a mystery, an enigma. He was a beast of a pass rusher at Arizona State in the Pac-12. He reminded me of a longer-haired passionate James Harrison as a firey guy, relentless, coming off the edge. I liked the player, but the Packers needed in inside linebacker. They, and local media, assumed they had drafted Bradford to play inside. But Thompson and defensive coordinator Dom Capers said no, that they drafted him to play outside. But he failed to distinguish himself in year one with the Packers at all, so instead of cutting the 2014 fourth round, 121st overall, pick, they kept him and began converting him to inside. Again, Bradford was rated a 5.3 by the NFL.com scouting. All that you just read about Bradford (6-1, 250) is more than you’ve seen of or heard from him in his career with the Packers, now entering his third season. Most people won’t even mention him because he’d done absolutely nothing. He doesn’t say anything about football on his own Twitter page. Aug 13, 2015 – Foxboro; Packers second year linebacker Carl Bradford pressures the Patriots quarterback as he’s set to throw it. Bradford needs more live action to show what he’s capable of. He could get cut next month. Or he could blossom and become a stud. He has to play to prove it. I was a huge fan of Carl at ASU and thought he could become a James Harrison edge-rusher. I also thought he could become a Junior Seau type passionate, high energy inside linebacker. Or at least similar to Desmond Bishop. I thought last year, when the inside linebacking play was so bad after Sam went out, that the Packers should have force-fed Bradford out there. Let him show what he has, learn on the fly. Surely he might have made some mistakes, but so do young quarterbacks, receivers, and defensive backs. So now we enter the preseason, and we have no idea at all how Bradford will perform on the field. Barrington is still hobbled by his foot injury that ended his season in week one last year. He might never be the same, and he was never the speedy linebacker before that. Hopefully he will bounce back and show the same skills Packer fans started to love in 2014. By default, due to his injury, it appears that the starting duo will be Ryan and Martinez, at least to begin this evaluation period in August. Things can change. Let’s hope it’s their play in the preseason games, five of them, as well as practices, that determine who opens up in Jacksonville. Remember, that is a very good offense with weapons wide and in the slot, and a hard running back in Chris Ivory, plus the young Yeldon. That will be an immediate test. Of course, the game after that is in Minnesota, which is perhaps the most important matchup of the season, with Adrian Peterson coming at them. So Packer fans, watch closely these five preseason games, and see how #50 Martinez, #47 Ryan, #54 Bradford, #48 Joe Thomas (6-1, 227), and #43, rookie Beniquez Brown 6-1, 236) fare in the middle, especially covering tight ends and running backs. I would not be surprised to see Brown, the undrafted rookie, beat out Bradford and Thomas for a spot on this team. 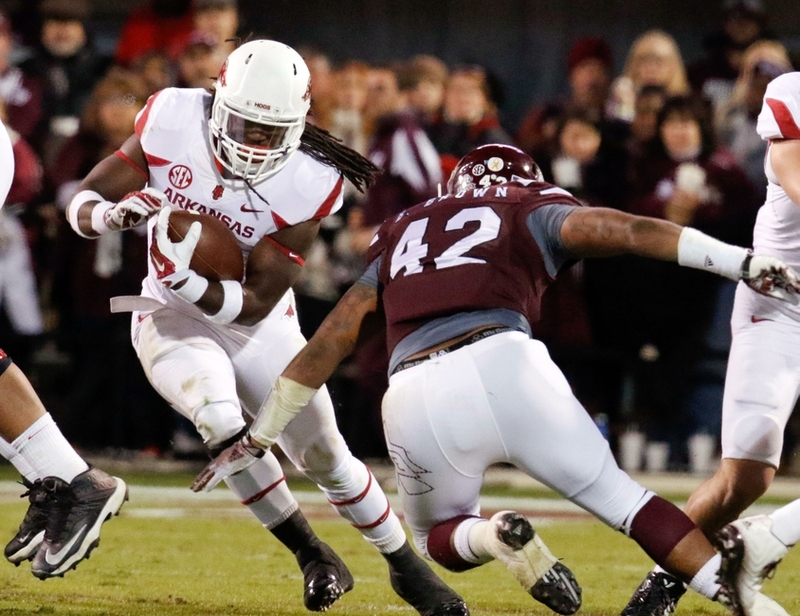 He’s a natural inside backer, who led Mississippi State in tackles each of the past two seasons. His college (SEC) credentials at inside linebacker surpass everyone on the roster aside from Martinez. 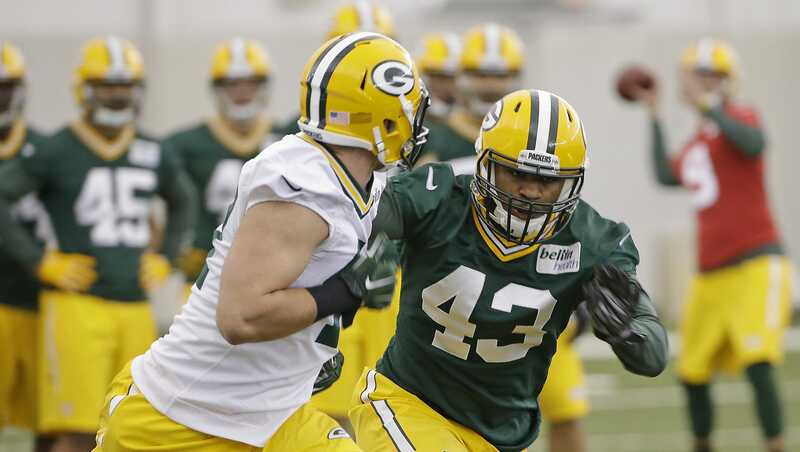 Packers rookie Beniquez Brown turns his hips to run with a Packers tight end during minicamp back in May. If the Packers are going to get back to the Super Bowl for the first time since the 2010 season, someone is going to have to emerge there, as Bishop did that season. ~GREEN BAY – On his first day in the NFL in full pads, Green Bay Packers second-round pick Jason Spriggs was not spared from the most difficult of assignments. He was told to go block Julius Peppers one-on-one in a team drill. On this particular play Thursday morning on Ray Nitschke Field, he fell victim to one of Peppers’ veteran pass rush moves and would have allowed quarterback Brett Hundley to get sacked if hitting the quarterback were permitted. “Julius got me,” Spriggs said. “Clay’s gotten me. They’re Clay and Julius. You’re going to get beat every once in awhile. Right now, I’m trying to be the best I can be and do what I can. The rookie left tackle realizes he’s reaping a reward for facing guys like Peppers and Matthews even on those plays when they embarrass him. It’s the first time he’s seen professional moves like that and failure is part of the learning process. Spriggs will have the luxury of watching that sack over and over again so he can figure out what Peppers did to beat him. Every part of his game will be broken down: alignment, getting off on the snap, footwork, hand placement, balance. It’s what training camp is for. The athletic Spriggs could be called upon to play a key role this season. Injuries at the tackle position caused serious problems last year and Spriggs could wind up being the backup on both sides of the line. ~GREEN BAY – Mike Daniels has taken a liking to Green Bay Packers first-round pick Kenny Clark, a young nose tackle whose addition has taken on added importance with the retirement of B.J. Raji. In fact, Daniels is quite excited about Clark’s potential. “For him to be as strong as he is and young as he is, it should excite everybody,” the veteran defensive end said. Clark found out how excited Daniels was to have him around on the very first day of training camp when his personal space was invaded upon returning to the sideline. Along came all 6-foot, 310 pounds of Daniels and the air horn that masquerades as his mouth. Talk about an introduction to training camp. “I think my nose was touching the side of Kenny’s face, I was that close yelling at him,” Daniels said. “He just said, ‘Yep, gotcha, gotcha.’ And you saw a change right away. Daniels is making it known that the defense really needs Clark to fulfill some of the potential that made him the 27th pick in the draft when the regular season starts Sept. 11 in Jacksonville. He wouldn’t say what Clark’s grievous offense was that caused him to go ballistic. He said it didn’t matter because it was done in part to let Clark know that this isn’t a redshirt year for him. The Packers don’t have Raji in the middle anymore and reserve nose tackle Mike Pennel is suspended for the first four games. Someone has to help pick up the slack. The 6-2 ½, 314-pound Clark is only 20 years old despite playing three seasons at UCLA, but the way he handled Daniels’ barrage showed he’s not going to be intimidated easily. Clark missed a large portion of the OTAs this offseason because rookies can’t participate if their school is still in session. Because UCLA is on a quarters system, he couldn’t show up until the final week of OTAs, his exposure to the defense primarily coming from Skype sessions with defensive line coach Mike Trgovac. Clark has been worked in slowly, but that won’t be the case for very long. “I feel good,” Clark said. “I’m just excited, you know what I’m saying? I feel like every practice, from yesterday to today, I feel like I improved. I feel like, when I’m watching film, I can tell what mistakes that I’m messing up on. Despite what Clark says, teammate Ha Ha Clinton-Dix, a first-round pick in 2014 who faced enormous pressure when drafted to fill a problem spot at safety, said it’s natural for the rookie to face high expectations. He said his advice to Clark was to avoid trying to be a savior. “I just tell him, have fun doing it, don’t be afraid to make mistakes,” Clinton-Dix said. “We’re not trying to make the honor roll here. We’re trying to be playmakers and make plays and have fun. Clinton-Dix witnessed the verbal assault Clark absorbed and said the rookie will quickly learn that Daniels is just that way. He said there’s nothing personal about it. He said when he first got to Green Bay, he thought Daniels was putting on a show with that kind of behavior. But he said he eventually figured out that it was his way of letting someone know that he thinks they can be really good. When the Packers lined up in their base defense for the first time Monday, Daniels was at left end, Letroy Guion was in the middle and Pennel was at right end. Clark was part of the group that backed them up. In the nickel, Clark and fellow rookie Dean Lowry were the third-team inside rushers. As time goes on, Clark will see more time, but for now he’s not expected to be a starter. It turned out that way Monday after Daniels’ tongue-lashing. On the final play of practice, Clark corrected the mistake he had made earlier and his fellow defensive linemen mobbed him to offer congratulations. ~Aaron Rodgers is coming off a poor season. That’s what his critics call his 2015 season. His passer rating was 92.7, his worst year of his starting career as the Packers’ signal-caller. But did you know that Tom Brady didn’t have a passer rating above 92.7 until his seventh season starting, which was his record-setting 2007 season. It was also the year the Patriots added Randy Moss. ESPN already is making a case for Brady as MVP this season, even with him missing the first four games. But imagine if the Patriots struggle in those first four games without him, and then he comes back and they roll once again. It would make his work look even better. Realize this: Rodgers has set the bar pretty high. How high? Higher than anyone, ever. And hopefully nobody ever breaks that record. Unless it’s him. But that seems impossible. His 2011 season was the best season ever, per the QB passer rating chart. He set the record with an incredible 122.5 that year, when he was 28 years old. Peyton Manning had the best season ever prior to that one, back in 2004. His rating that season was 121.1, and he also was 28 years old that season. So do quarterbacks peak when they are 28 now? Not necessarily. Here’s the thing about Rodgers performance last season and that 92.7 passer rating: Back in 1997, Brett Favre won his third straight NFL MVP award, with a passer rating of 92.6. Hmm, maybe Rodgers’ season last year wasn’t that bad afterall. The difference was those Packers were at the top of the mountain, getting to the Super Bowl for the second consecutive season. Favre’s age that 1997 season was also 28. The next three seasons, Favre’s ratings were 87, 74, and 78. Yikes. In fact, Favre did not have a season over 96 until his first season with the Vikings, 2009, at age 40. His rating that magical (regular) season was 107.2. It was the first season since 1996 for him throwing fewer than 15 interceptions. Rodgers threw eight interceptions last year. Yes, 8. Favre’s fewest ever in any season was 13. Rodgers worst season was also 13 in his first season starting, 2008. He also threw 11 interceptions in 2010. But he ended up winning the Super Bowl MVP that season as well. Rodgers has thrown no more than eight interceptions since that 2010 season, or 33 total interceptions over the past five years, since delivering that Super Bowl. And that’s against 170 touchdown passes. So let’s take a step back and realize how truly great Rodgers has been. And still is. With his supporting cast. Losing Jordy was devastating. You cannot replace guys like him. The “next man up” talk is just coach-speak. And coach McCarthy and QB Rodgers were well aware of that. They just hoped Adams and Cobb would step up. Instead, they stepped down. Of course, Packer fans are well aware of what the problem was last year. The problem was Jordy Nelson going from being as good as any receiver in the NFL, to being out for 100% of the season. And even though a lot of the pundits, nationally and locally, refuse to comprehend just how significant that was. They say “well that can’t be the whole reason”. True, Davante Adams played like a butterfingers candy bar mascot. Remember, the tight ends and leading receiver, James Jones, could barely outrun some offensive tackles. But it all started with Jordy going down. Some players are special. They are not replaceable. Nelson is one of them. However, now it’s 2016 and he’s back. So is this guy, Jeff Janis. He appears to have finally arrived, finally was given a chance in the last game in Arizona. And he delivered. He and Nelson both possess a great combination of size, and “deceptive” speed. Second year receiver Ty Montgomery also should return healthy. When healthy last year, the first six games of the year, he put up good numbers and was a mismatch for the defense. Remember, the Packers were undefeated while Montgomery was healthy, even without Nelson. Adams will be healthy again by week one. And so will Jared Abbrederis be. He showed in the playoff game last year at the Redskins that he can be counted on to make plays. Remember the red zone problems? Fourth and goal, end of game, Packers needing a touchdown on this play to tie the game. Great playcall, design by Coach McCarthy. Rodgers looked away and ultimately forced an interception before getting sacked. Cobb, obviously was wide open as the playcall designed. Stalls near the goal line in losses to undefeated Carolina at the end of the game, the end of the Bears game at Lambeau cost the Packers wins. The Packers also failed there against the Lions too, ultimately losing that one when placekicker Mason Crosby shanked his tee shot as time expired. As bad as Rodgers and the Packers offense “seemed to be”, remember this: They almost pulled this game out at Carolina, when Montgomery was already out -along with Nelson. And the Packers almost beat Arizona in that dramatic playoff game, in Arizona. Those were the two teams in the NFC Championship game. The Packers will be right there again, injuries-dictating. Jared Abbrederis beats his defensive back for a red zone touchdown against Will Blackmon of the Washington Redskins. Notice the great footwork and separation he got. This is what was missing for the majority of the season. Nobody can predict who is going to be healthy and who is going to get injured. There are always injuries. They happen to every team. Dallas was decimated last year with big injuries to Tony Romo and Dez Bryant. Seattle lost Jimmy Graham, whom they traded a first round pick and a former first round pick for. He was lost during the season to a bad knee injury, worse than Nelson’s. But if all things are fair this season, Aaron Rodgers is going to be back at the top of the quarterback chart. Cam Newton, Russell Wilson, Carson Palmer are fine quarterbacks, and Newton certainly earned that MVP last season. He also had lost his top wide receiver in the preseason, to an ACL. Wilson lost Graham, who was supposed to be his top target. Those two stepped up. But they also were thought of as running teams, and opposing defenses didn’t gameplan to stop them, rather they focused on stopping the running games. Defenses will adjust this year on them. In the meantime, I expect Nelson comes back slowly, but rounds into form by the beginning of November. While he’s working his way back, Rodgers will realize that Janis and Abbrederis can be counted on. Your 2016 NFL MVP, Aaron Rodgers. By the way, I see him getting his second Super Bowl MVP next February, down in H-Town. His third MVP will tie Favre, and his second Super Bowl MVP will tie Bart Starr, as tops in Packers history. And at tight end, Rodgers has a new toy in Jared Cook. Cook is very similar to Jermichael Finley, skill-wise. Cook signed just a one-year deal, so he’s going to lay it all on the line to put up as big of numbers as he can. He wants a long term deal the following season. Adding Cook’s speed and size, along with getting Nelson and Montgomery back, Cobb and Adams, Rodgers will have a plethora of options. The MVP pretty much always goes to a quarterback now, with the exception being Adrian Peterson and his 2000-yard season back in 2012. To be the MVP, the QB has to put up huge numbers, and his team has to be one of the best few teams in the NFL. That leaves the usual suspects, from Rodgers to Brady to Newton, Wilson to Palmer, Roethlisbreger to young Andrew Luck perhaps. My money is on Rodgers. And yours should be too. I’m calling for Rodgers to notch 37 touchdowns to 7 interceptions, for about a 109.5 passer rating. He will do so in leading the Packers to a 13-3 record, good for the NFC’s number one seed, where they belong. ~In some ways, this seems like so long ago to me. In other ways, it seems like only yesterday. Being there at AT&T Jerry Jones Stadium in Arlington, this was the “center of the universe” at the time. It also became my favorite moment in time, surpassing, well…. sad to say it, but it was more enjoyable than my beautiful wedding in Oahu, or the birth of my two sons. True, those three moments were more important and significant for me. But the “high” I felt being at that Super Bowl, during the game and after we won, is a feeling I have never come close to feeling before or since. This great production by NFL Films still occasionally brings me almost to tears. ~Earlier this week, the PFF analysis team ranked the NFL’s defensive front-sevens from best-to-worst, and today we are finishing off the back half of the defense with rankings for each secondary. Our analysts took both top talent and depth into account when ranking each group. With the use of nickel packages continuing to be more prevalent, we’ve listed five defensive backs for each team as “projected starters,” regardless of whether or not the specific team uses nickel personnel more than its base package. As we near the 2016 NFL season, here’s how all 32 secondaries stack up. Key stat: All five Denver starters ranked among the top 30 players in overall grade at their respective positions last season, the only team to do so. Not only do the defending Super Bowl champions boast the top front-seven, but they also possess the league’s best secondary. Denver’s top three cornerbacks are the best trio of corners in the league, with all three finishing among the top 30 at the position in the NFL last season. Harris continues to be one of the NFL’s best cornerbacks, and excels in the slot. With Ward and Stewart at the safety positions, it’s tough for quarterbacks to find a weakness anywhere in the Broncos’ secondary. Whether he’s considered a cornerback or safety, Mathieu was one of the five best defensive backs in 2015, and his versatility cannot be overstated. In fact, he was the top-ranked cornerback in both coverage and run-defensive grades before his season ended prematurely. Peterson bounced-back from a down year in 2014 to reclaim his spot as one of the league’s lockdown corners. The rest of the secondary is not as consistent, but Bethel and Jefferson did produce their highest-graded seasons in coverage of their respective careers last year. Key stat: On nearly 750 snaps in coverage over the past two seasons, Harmon has more interceptions (five) than receptions allowed (three). After the Patriots moved on from Darrelle Revis and Brandon Browner, Butler and Ryan stepped up as full-time starters last season. The duo combined for six interceptions and 27 passes defensed, as they both ranked among the top 25 cornerbacks in overall grade. McCourty and Chung have blossomed into one of the best safety pairings in the league, while Harmon has excelled in his sub-package role. The secondary’s biggest weakness is their third cornerback, but they hoped to have improved at the position with the selection of Cyrus Jones (Alabama) in the second round of the draft. Key stat: Sherman allowed just 48.4 percent of passes into his coverage to be completed, fourth-best in the NFL in 2015. The “Legion of Boom” isn’t quite what it was a couple of years ago, but that’s due solely to not having the caliber of No. 2 and No. 3 cornerbacks that they used to own. Sherman is still one of the few truly elite NFL corners, while the Thomas-Chancellor pairing at safety remains one of the league’s best duos. Last year, Sherman and Thomas both ranked third in overall grade at their respective positions. Chancellor had one really poor game in coverage versus Cincinnati, but otherwise fills the strong-safety role better than most. Beyond that trio, Jeremy Lane has shown glimpses of good play, but due to either injury or being a role player, has not seen more than 356 defensive snaps in a single season in four years. There is also the question of who will be the No. 3 corner between Shead, who struggled last year, and Simon, who struggled in the 2014 playoffs before missing last season due to injury. Key stat: Quinten Rollins allowed a 58.1 passer rating into his coverage last season, tied for third-lowest among all cornerbacks. Ever since losing Nick Collins to a career-ending injury in 2011, the Packers have gone through numerous players searching for his replacement. Clinton-Dix made huge strides in run defense in his second year as a pro. He still has a little room for improvement in coverage, but clearly looks to be an ascending player. Burnett earned the highest grade of his career last season, despite missing several early games, and both safeties ranked among the top 10 in overall grade at the position in 2015. Sam Shields intercepts a Ryan Tannehill pass in 2014. At corner, the Packers lost Casey Hayward (Chargers) in free agency, but Quinten Rollins was impressive in limited playing time as a rookie and may very well step in without the secondary missing a beat.